Perhaps the most intricate and subtle of all Disney park backstories is that of Dinoland USA at Disney's Animal Kingdom Park. Seemingly hated more than it is loved, the area actually has a pretty high standard as far as extensive theming is concerned. Lets break it down quickly, k? Chester and Hester own a mom and pop style filling station in Diggs County. One day, a dinosaur fossil is discovered nearby and an archeological school, including its many rowdy students move in right across the street from the station. The school thrives, and as it does Chester and Hesters gas station starts selling dinosaur related merchandise...and becomes a tourist trap for folks interested in the dig. As the fossil sight matures into The Dino Institute, Chester and Hester open up their equally impressive and wonderful Dino-Rama. Chester and Hesters filling stations. Though Chester and Hester's has been a dino hot spot for some time now, you can still find many indications to the previous use of the space. Be it coke machines, gas nozzles, or pay phones...including scribbles on the wall...imagineers had no hard time filling this space. Up on a shelf, a portait of "Chester and Hester." 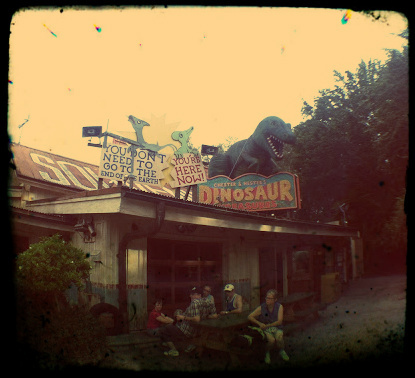 This store, and Dinoland in general, has always fascinated me. Upon entering you are bombarded with fanciful details...too many to ever fully grasp. Dont just brush this area off like most people. Next time, take a second to poke around a bit. I think C&H's part of DinoLand is terrific, and that extends to Restaurantasaurus, where each room is themed differently. Is it weird to wander into each room, staring at walls behind patrons' heads?